Okko will be missed by all of the members of his troupe, especially his Project X co-star Willie. Willie was born at San Antonio’s Southwest Foundation for Biomedical Research. He was raised by his mother only for six months, then moved to the lab’s nursery. He was transferred to the entertainment business around the age of three. 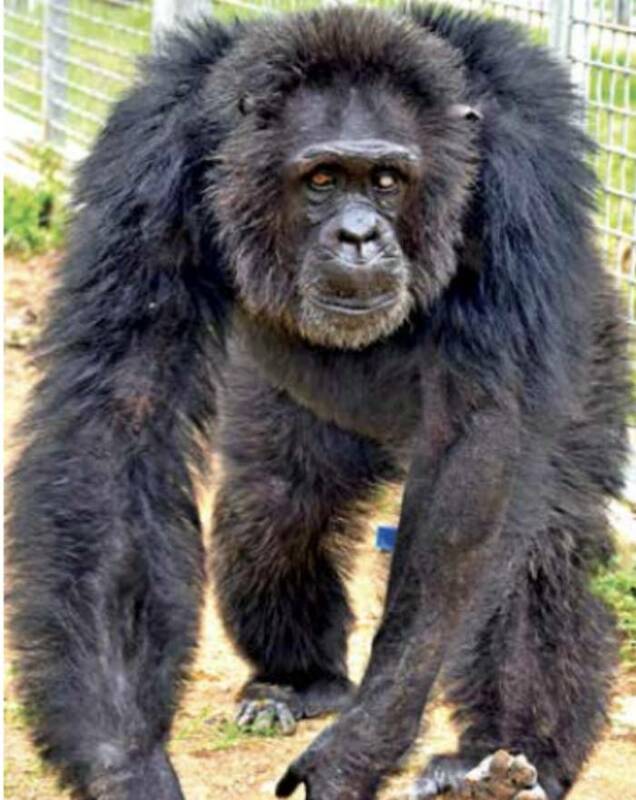 Our hearts broke on Jan. 19 when chimpanzee Okko, 37, passed away suddenly from a heart attack. He was enjoying a pineapple party with his best friends Willie, Koko and Chobe before he died. An imposing yet well-socialized individual, Okko always kept the peace among his spirited companions. Okko especially loved red apples and Romaine lettuce. 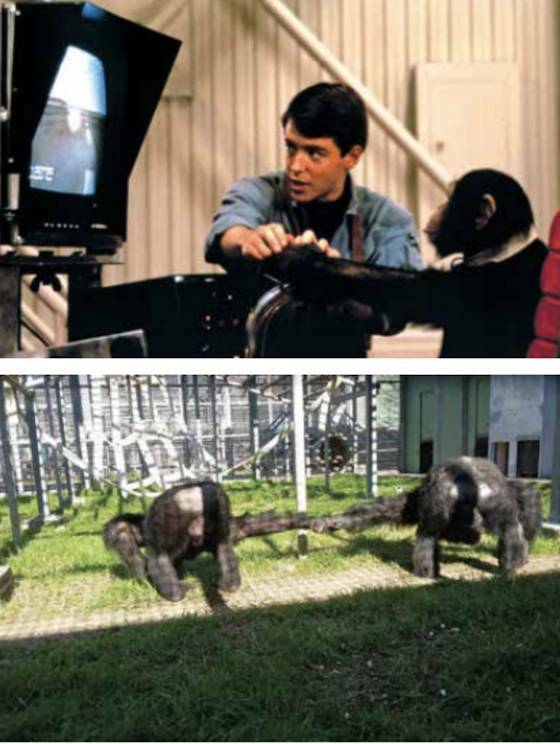 Okko was one of five chimpanzees, including Willie, who starred in the 80s film Project X starring Matthew Broderick, who played an airman assigned to care for chimpanzees used in a secret Air Force project. Willie actually had the role of Virgil, the chimp that Broderick’s character bonds with. In 1986, they were brought to Primarily Primates (PPI) after a lawsuit was brought against the film’s producers for alleged abuse of the chimps by their trainers. When the filming ended, Twentieth Century Fox planned to sell the chimpanzees to a lab—a reprehensible irony as the film focused on a young chimpanzee’s escape from radiation tests in an Air Force lab. Don Barnes, a sensible technical advisor for the studio, warned Twentieth Century Fox of the public outcry likely to follow a transfer of the chimpanzees to a lab. He led the crusade to bring the chimps to PPI. Okko was born Nov. 25, 1980 at the Arnhem Zoo in the Netherlands and promptly put on exhibit. He was later traded away to a New York dealer, and sold again to Twentieth Century Fox. “I will remember his love for his caretaker Elicia the most. He would climb to the very top of his outdoor habitat and wait for her to arrive to work every morning,” said Brooke Chavez, director of Primarily Primates. Willie and Okko knew each other for most of their lives from their time in the entertainment industry to their years at PPI. Care staff members say that these two made an interesting duo—as the alpha, Okko was the leader of the group but Willie was his second in command. Their personalities balanced each other out; Okko was social and outgoing while Willie is a bit more shy. Because of the damaging experience of the entertainment industry, Willie has a difficult time trusting humans. Senior care staff member Elicia Bryant recalls that when she first started working at PPI, Willie wouldn’t even make eye contact with her. “But I believe that my close relationship with Okko helped strengthen my bond with Willie, perhaps because Okko showed him I could be trusted. Over time my friendship has grown stronger with Willie, and he even initiates play from time to time.” She said after Okko’s passing Willie retreated a bit and showed signs of anxiety but he has returned to being social with Chobe and Koko. In fact all of Okko’s friends have been embracing each other a lot and holding hands in an effort to comfort eachother.“As a group, the chimps and I have been mourning the loss of our dear friend, but it has brought all of us even closer,” Bryant said.